The bill, if passed, will authorize President Obama to provide assistance, including through multilateral, non-governmental, and faith-based organizations, to prevent child marriage in developing countries and to promote the educational, health, economic, social, and legal empowerment of girls and women. According to USAID, the marriage of girls under 18 is a common practice in many developing countries, including Ethiopia, and in some regions it is a deeply-rooted tradition. USAID research shows that “the practice can produce large families, poverty, medical complications due to early childbearing, increased vulnerability to HIV/AIDS, high rates of divorce, and interruption of education.” There are already an estimated 60 million girls worldwide who are child brides; without serious action to end this harmful tradition 100 million more girls are expected to be forced into marriage in the next decade. 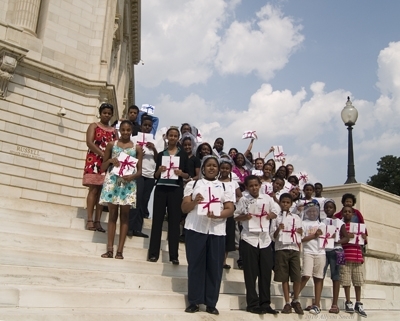 The lobbying effort, which was coordinated by Plan USA – part of Plan International, a world-wide non-profit organization with country offices in 48 developing countries including Ethiopia – used letters written by volunteers from each of the 50 states asking the Senators for their support to pass the law so that no girl ever has to be forced into marriage, at ages as young as seven! Nardos, a young Ethiopian-American girl, was brimming with excitement to be walking into Senate offices, gladly attending a Congressional hearing about child marriage and speaking to Senate aides. 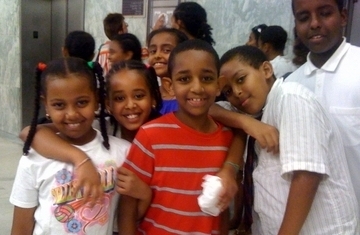 The kids gather to lobby congress on July 15, 2010. Courtesy Photo. Hopefully this youth-led effort will help push the Senate, in its final marathon before adjourning for the year, to pass this important act, and help millions and millions of girls worldwide have the chance to be just girls, not wives. These young global citizens are participants of “Because I am a Girl” – Plan International’s campaign to fight gender inequality, promote girls’ rights and lift millions of girls out of poverty. Saba Fassil is a graduate of the George Washington University, where she earned a B.S. in Economics. In my opinion early child marriage and FGM are one of the worst worst things that grown-ups willfully subject young children to. I recommend to all to watch the movie Waris Dirie, played by Ethiopian-born actress Liya Kebede who is also an activist for girls-health, to understand the life-long trauma these practices bring upon people. I applaud Saba for giving voice to this important bill and for engaging the youth with their lawmakers. The experience provides these kids not only with a sense of ownership of issues but also real-time schooling in the process of campaigning to pass or change law in the U.S.political process. The abusive condition of early age marriage at different parts of Ethiopia exposes young women to different health hazards, like fistula. This is an excellent initiative. Well done! Hope they pass it too! More power to the youth. Fantastic indeed. Very positive, well written piece…hopefully this law passes but with Congress you never know..